When it comes to buying a brand new mobile phone deal, the one thing more expensive than a top of the line smartphone is when you want to get it complete with a massive data allowance. But if you've been considering dropping a daunting amount on the newest iPhone deals or a top of the line Samsung phone deal, we might have found a better option for you. Currently offering some of the best phones in the world at market leading monthly prices, Virgin Mobile could be the way to go. It's set its 100GB tariffs at only £4 more than its 1GB contracts. 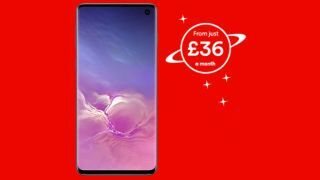 With the offer of 100GB of data with no upfront costs on phones ranging from the brand new Huawei P30 and P30 Pro, to the Samsung Galaxy S10 and brilliant iPhone XR - there is a lot of options here. The last two mentioned handsets are available for £36 and £34 per month respectively, which is outrageously cheap considering there's nothing to pay upfront. So why are these prices so good? Virgin Mobile has a tendency to offer 36 month contracts on phones, adding an extra year to your time with the phone. Considering how affordable these contracts are for 100GB and how well phones last these days, that will be music to the ears of some - or torment to those who need the newest phone every year! But if a three year tie-in is fine by you and you're ready to get a brand new, big data deal for less then you can find all of the contracts down below or explore them at your own leisure on the Virgin Mobile page. All of these offers are completely free upfront, 36 month contracts and offer up 100GB of data. They include 5,000 minutes of calls and unlimited texts, too. The only differences are the handset and the monthly cost.